Welcome to episode 45 of our kidlitwomen* podcast! Every week this podcast will feature an essay about an issue in the children's literature community (Monday) and a discussion about the essay (Wednesday). In this episode, Laurel Synder discusses her essay "No More All-White Panels: A Pledge." (which can be heard HERE) with Jacqueline Davies. Laurel and Jacqueline discuss the the eye-opening statistics. 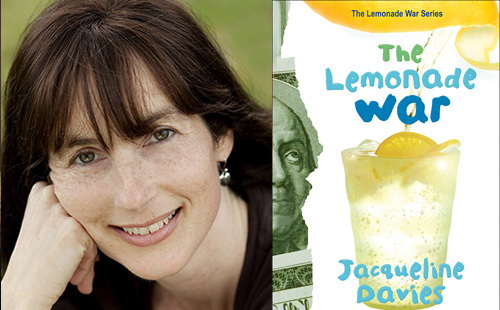 Jacqueline Davies is the talented author of YA and middle grade novels as well as picture books. Her beloved The Lemonade War series, tells the story of a brother and sister who make a bet to see who can sell the most lemonade in five days. The second book in the series is The Lemonade Crime; the third book is The Bell Bandit; the fourth is The Candy Smash; and the fifth and final book in the series in The Magic Trap. Her newest book Nothing But Trouble (HarperCollins, 2016) tells the story of two smart girls in a small town who can't help but get into trouble by pulling pranks. See more about Jacqueline at her website. Jackie: Hi, this is Jacqueline Davies, and I'm here talking today with author Laurel Snyder. Hi, Lauren, how are you? Laurel: I'm good. How are you today? Jackie: Very good. I'm glad that we finally have a chance to talk, and what we're going to be talking about today is the piece that you wrote for Kidlit Women back in March, which was entitled No More All-White Panels Pledge. What made this piece stand out from so many of the other wonderful pieces that were also in Kidlit Women was that this was a true call to action. This was a piece that was saying to the people reading it, "We need to actually do something and will you do it and will you sign your name to it?" There was a commitment factor to it and I wondered if you just talk a minute about that aspect of it. Laurel: Yeah, it came about in a group way. There was something Grace was thinking about, it was something a bunch of us were thinking about and it felt like there needed to be space for ... I mean, as you're saying, as a call-to-action, and that the idea of a commitment to diversity needed to come from a white person and that commitment to trying to eradicate gender bias in the same stuff needed to come from a man. That was an important piece of it. We discussed it and there was some logistical run around, but at the end of the day, ultimately, I just wrote my pledge and launched it from originally my website and then we post it to Kidlit Women. Jackie: Right, had you based it on something else that you've seen? Was there something else that served as a model or an inspiration or guidelines of how to do something like that? Laurel: I feel like we've seen in the last year a lot of different things where I feel like we're all fumbling to figure this out, and that's part of what's scary about it is I think a lot of the time we don't know if we're doing this the right way. We don't know. We assume that we're making mistakes as we fumble forward, but that making mistakes and trying to improve things is better than sitting back and being quiet and not taking action and hoping nobody will notice that we're not helping. I think a bunch of things that happened, Gwenda Bond had done something and NRC Survey had done. The people were taking steps forward and trying to, I don't know, corral the online community into sharing information, being more transparent. There's all different kinds of things that we're trying to do, and so I think that that's where this started. Jackie: Yeah, and it's an interesting thing because I think as authors and creators, because obviously illustrators are involved in this as well, I think we're more comfortable with words, ideas, expressing ourselves. But sometimes I think taking action is where we fall short a little bit and that's why this pledge that you wrote was such a specific challenge, I think, to some of us to say, "Okay, we can talk about this but now we actually have to do something." It's the doing that I really want to focus on with you today because I think that's in talking with other author friends of mine who've taken the pledge, who've thought about taking the pledge. I think that is the stumbling point, the actual doing of it, the taking action. In order to focus, and you bring up the point that we are with this pledge, we are focusing on one part of a large problem. Laurel: That was a real challenge. Jackie: It's a very large problem, it is. Laurel: That was a real challenge of figuring out, obviously, everything is intersectional but sometimes in trying to be intersectional we lose sight of individual pieces, and that was the real challenge. The pledge was we wanted to talk about gender fluidity, we wanted to talk about queer identities, we wanted to talk about gender. There were all of these and socioeconomic stuff but at the end of the day it felt like there's a very clear bright line in our industry that is problematic, that is just a more obvious problematic thing than all the other ones and that is race. That wanting to nod you and recognize how complex races, but also say those complexities shouldn't get in the way of us being willing to say, "It's very simple, this is a white industry, the prizes is whiteness." Where the control and editorial and gatekeepers are also white, and so that's going to perpetuate itself until somebody does something very specific. Jackie: Focus, focus is critical because without it, we can't take even that first step. I got into a long and interesting conversation with somebody yesterday about this very topic I was mentioning that I was going to be talking with you. Because this person was incredibly well informed, has a mind that goes in a lot of different directions and is able to look at things from many different points, the conversation kept veering off into, "But what about this, but what about this, but what about this." That's all valid, it really is. Jackie: But there comes a point at which I think it's also really important to focus and say, "Okay, yes, there are so, so, so many things, so many approaches to a problem like this, but let's stay focused on this one thing." In honor of focusing, I'm going to first read, I think, it's five statements from your essay. I might paraphrase just a little bit. Jackie: Just because I want to start off by saying let's say that we agree on all of these. I think many of our listeners probably do, some of them might not and that's okay, but let's just say that as a starting place, we're going to start with these five assumptions as truths. One is that the children's book industry marginalizes people of color. One is that there's been a growing movement to improve this situation. One is that publishers send out authors who sell a lot of books and that because of that, they send out mostly white authors, and that this, as you say, success breeds success, money follows money. This causes a cycle, a perpetuating cycle where white authors are out there, they're being noticed, they sell more books that causes the publishers to put them out there more which causes them to sell more books. Jackie: Let's just start with that as ground zero. We're all going to agree on that. So then the question becomes what do we do? I'm going to focus, the pledge is short, it's to the point, and the heart of it in terms of taking action is this one sentence, "We pledge to decline service on all white panels of three or more speakers, excluding the moderator, at any conference or festival and to decline invitations from any conference or festival without meaningful representation overall." Jackie: There are two parts to it, right? Let's start with the first one. Let's start with the declining service on all white panels of three or more speakers. It's super specific, which is great, it's great. It's like, "Look, here's the formula, this is what we're looking at." Laurel: Yeah, it had to be because as you say like we're a community of thinkers and talkers and less doers and we went down the rabbit hole like talking to people and trying to figure this out. It was like, "Well, what is a panel and is a moderator a panelist?" It was like, "Oh my god, I'm just going to lay numbers down." It was on some level arbitrary and this is what I mean about fumbling, on some level it was arbitrary. I picked, because I was doing it, I picked and I could have done a different set of numbers. It just had to be a step forward. It's like writing, you write the bad first draft so that later you can revise it and this just felt like we were striking forward and later we'll figure out how I made a mistake. Later we'll revise what we've done and when the next person does the next thing, they'll do a better job. But this was the first draft, if that makes sense. Jackie: Right, and arbitrariness has its own validity. Jackie: There is something perfectly valid about being arbitrary about something but I think again the necessity was to be specific so that ... Because, okay, I'm going to get into this in a minute about the comments that followed. You got a lot of comments on that, I think there were about 240, maybe more comments. Laurel: Yeah, I think, I hate to admit this, but I think I may have checked out at some point. It's been an interesting year. Jackie: I can understand that. Well, that would be interesting to hear but to hopefully get to that in a little bit. But so there was a strong response and overwhelmingly the response for our listeners who might not have been clued into any of this was, "Yes, yes, sign me up. I signed the pledge. Jackie: I'm ready to sign. Laurel: It was really easy to sign up. Jackie: I think the people who didn't sign up, didn't comment on it. Jackie: They didn't write in to say, "You know what, I'm not signing up and here's the reason why." Jackie: Yeah. It wasn't, the comments section, wasn't a discussion, it was more of a rallying cry like we're all here and that's great, that serves a purpose too. But it was noticeable that there were comments in which people were saying, "Yes, sign me up. Oops, except I'm already doing this panel or oops, I already agreed to do this, or, oh, does this count because I'm doing this but this is the reason why I don't ..."
Laurel: My physical experience of the aftermath has been very much the same, which is like almost 300 people signed the pledge on my website and then I started getting phone calls and emails from people saying, "Hey, can you help me figure out how to navigate this thing?" Again, we're fumbling and I would be like, "Well, let me think about it." Coming to me and saying I want to be able to hold to this pledge and I don't want to have to drop out of this event, or I want to be able to be respectful. Like I agree with you 100%, I totally support you and they're writing from a festival, they're writing from an institutional organization, they're writing from a bookstore, and they're saying, "I totally support it, I'm all about diversity, choose kind, rah, rah, rah. But I need you to tell me that it's okay that I'm not going to be compliant." That has been an interesting experience. Laurel: I think about this a lot in terms of comfort, that the people who sign the pledge, by and large, because they're signing the pledge, we know they're coming from a position of comfort and privilege. The idea that the talking and thinking, the idea of this thing is something they totally agree with and they probably sign a lot of online petitions and they probably donate money to progressive candidates in other states. This is what we all know how to do right now, is to click the button. We click the button and now you're being asked to give something up that is going to be personally difficult for you. What that is, is we're asking you to give up a little comfort, we're asking you to give up a little privilege and that's hard. It's been this interesting thing and in some cases, it's been very hard for me to respond to that because that's all I can really say to them is, "Look, you liked the idea of this, you're not used to sacrifice in this kind of way." Laurel: You want to go to the demonstration but the idea that you might get arrested at the demonstration is foreign to you. You like to donate money but not money that you actually need, this idea of sacrifice is a different thing. So sometimes I'm saying to people, "I hate to say this to you, but it's time to sacrifice something." That's uncomfortable and I'm totally empathetic to that and I know exactly what that feels like. But that's what this, this is a moment for you to choose whether you're actually willing to put action behind your words. That's a hard conversation to have with people. The other side of it is there have been many moments where somebody has reached out and said, "Help me find a way to be compliant." What they're really saying is help me find a way to be compliant. How do I approach this festival and ask them to make changes? I'm running a festival, how do I reach out to publishers and ask them to send me more authors of color? Laurel: What's been amazing is it's actually been really successful and easy and a couple of times that that's happened where somebody has reached out to me and said, "What do I do?" I've said, "Okay, well, here's some suggestions like let's see a bunch of people on the email you sent so that we know there's accountability and transparency within the organization." Don't make one person responsible for making this decision, make four people responsible for talking to each other and making this decision. Things like that where there's brass tacks of how to close the loop and how to make things more transparent have made it really easy. In those cases, it's been amazing how within 24 hours the problem is solved, panels are shuffled, new authors are invited in. In some cases, there have been festivals where there was somebody already at the festival for something else. Laurel: It was a perfect fit for the panel that was problematic, and it literally just took shuffling but because this isn't in the front of people's brains, they hadn't done that shuffling. What the pledge did was demanded that the author who cared about being compliant say something uncomfortable, ask a hard question of the festival or the conference. That's the thing that's been amazing is that there's two sets of conversations. One set of conversations is I can't make you feel better about the fact that you don't actually want to do this thing and the other set of conversations is, "Oh, you do want to do this thing, let's figure out the best way to do that." Jackie: No, no, no, it's great. These are the things I really want to drill down into because I'm a very practical person and I like practical solutions. You've got the problem of, let's start with the first thing that you were talking about, the problem of someone saying, "I totally believe but I don't want to do the hard thing. I don't want to do the thing that's hard." You had what was a difficult conversation with them because it sounds like you called that out. It sounds like you named it, you named it for what it was. Laurel: In most cases, that honestly there have been a few that I have let slip past me, that's been part of my job in all of this is like the self care of. There are moments where I'm going to spend too much time and energy on something that feels like it's not going anywhere. There have been a couple places where I've said, "It doesn't sound like this is going to be productive. I'm not in a position to help you with this, you're going to have to figure this out for yourself." But for the most part, yes, for the most part I have been able to say, "Okay, this is a hard thing, let's figure out how to do it." Jackie: Do you think people were able to hear you? Do you think they can hear what you were saying? Laurel: In some cases, definitely. Jackie: Because in some ways, you're lobbying a criticism at them, it's not really a criticism, it's shining a spotlight on something about themselves that maybe they would rather not acknowledge. Jackie: Were they able to take it in? Because some people can, some people can't. Laurel: Yeah, I think so. Jackie: For the most part. Jackie: People have all kinds of defenses. Laurel: You know what, the people who have been most able to talk about this, interestingly, I haven't thought about this until just now, have been the people who were least prepared to have the conversation. Like the newer the idea. Laurel: I will say this, it hurts me to say this, the people who've been most responsive in that brass tacks way have actually been men. Jackie: ... as having power that they're thinking, "Oh, I can do that." Laurel: I'll fix this. Now that I see the problem. Jackie: Whereas women who spend so much of our time thinking, "Oh, well, we don't have any power. We can't do that, we can't say that. That sounds rude, that doesn't sound polite. They've invited me to this conference, it doesn't seem like a nice thing to do." That the thought of what you're asking them to do is so difficult. It feels almost so beyond them. I wonder if that might be one part of it. Laurel: I should say we're talking about a small set here. This is I'm not talking about 50 men, I'm talking about five men. Who knows? I don't know if we can really extrapolate anything from this data of mine but that seems reasonable to me. It definitely feels like the people who've had the hardest time with this are the people who have an idea of themselves and I promised myself before I came on here that I'm not going to name any names or organizations at all. Jackie: No, no, we don't need to. I don't think it's useful, to be honest. Laurel: I don't, right, I think it becomes scapegoating and then everybody else gets to say, "I'm better than that." I'm trying to keep it vague, but there are some very progressive, minded, well intention people. Honestly, women like me, women who grew up on the left, who think of themselves as progressive, who think of themselves as diversity minded. I grew up, maybe, grew up in a multicultural community, that kind of stuff, who think of themselves as not the problem, and men too, this is not gendered. When people who feel that way about themselves, and I think that is by and large the literature in education communities. When people who think that way about themselves already, it's like, "I'm a well intentioned person, I'm a good person. I didn't vote for the bad guy." That person is suddenly faced with their own bias. Laurel: This happens to me, please like this is me too. This is my experience, I've spent, I feel like I've spent the last couple years growing and trying to grow and making mistakes and fumbling and learning. I feel like when somebody in that situation has to rip the blindfold off and recognize what they're staring at in the mirror, that's really hard. I think for somebody who hasn't thought that much about it, for whom this is a like, "Oh, this is an interesting idea." It's actually in some ways a little bit easier to say, "Oh, I can change my behavior because my sense of myself as a do-gooder isn't like at the core of my identity." Laurel: I see a lot of this, honestly that I'm Jewish, and I see a lot of this in the Jewish community right now. That there's a lot of infighting of like, "Well I'm Jewish and a democrat and I grew up in the northeast, I can't be racist," kind of stuff. I'll call it out because it's my community of like, "Yeah, that's not true." I think we see some of that in literacy and education that we've all been choosing kind. We're choosing kind and choosing kind and choosing kind. It doesn't occur to us that choosing kind, what that means might difficult and painful and not nice and not polite and might cause other people discomfort and might have to require us to change who we are. Jackie: Yeah, choosing kind isn't always pretty. Laurel: No, it's not nice. Jackie: I think there's part of us who think well it must be, choosing kind must always look pretty but it doesn't always look pretty, sometimes it looks like conflict. Laurel: That's right, that's right. Laurel: Best practices for sure. Jackie: Do you do it by email? Do you do it by phone? Do you talk to the organizer? Do you get allies? Do you form a coalition? How do you do this? Laurel: I think there's a couple of different ways of looking at this and I think the first and most important thing is, well, the first ... This isn't brass tacks, this is like attitude, but is to assume that everybody is trying. We all want to assume that because we are basically all working on literacy and children. We are all working on culture and art and belief and diversity and multitudes of voices. If you proceed to begin, if you begin with the assumption that everybody is on the side of the angels and we all have blinders, and so your job isn't to correct somebody's intention, your job is to help provide them with options or solutions that will allow them to do what it is they want to do anyway. Because I think that's what I've discovered is everybody I've encountered, everybody I've seen really push back for the most part, what happens is the other person goes, "Thank you, like, thank you for the help, thank you for the list of names. Thank you for bringing this to my attention." Laurel: A disaster, right, exactly. Jackie: ... that can come back later. Laurel: Absolutely, so in some cases, I think it is about the more if you're ... I think this is true in life, in general, if you're stepping forward with a criticism, if you come with a solution, it's always better. If you're saying, "I've noticed that this panel is all white, I've taken this pledge ..." And then it's always the pledge takes the burden off of you like I took this pledge, I didn't know this moment was coming exactly like this but I took this pledge, I feel the need to be compliant. Here is a list of names of people who live within two hours of your festival that I think you might not know about because they aren't a Newbery winner and they aren't a Caldecott winner and they aren't a best selling author. We, the authors, we all know each other. I can name a list of a million voices of color who are writing beautifully for children who probably aren't invited to the festival because they aren't one of those marquee authors who brings in the dollars. Jackie: Okay, let's just jump in there. Let's say that I am an author, a white author on an all white panel and I don't know anybody within two hours of Wichita, Kansas because that's not my playing field. What are some resources? Where can authors go and say, "Let me find some really great names that I can present to this conference organizer?" Laurel: Well, I think most of us, anybody honestly listening to this podcast is on Facebook or in Twitter or however they're involved with SCBWI, and those organizations and Facebook spaces and social media places are full of people. I feel like if you don't know an author of color within two hours of Wichita, it's because you didn't want to, to be perfectly honest. If you are aware of these issues and engaged at this conversation, then go follow people with different lives from yours on Twitter. That there are whole communities, and I think sometimes this is about casting a wider net of saying, "Okay, what about debut authors? What about people on smaller presses? What about people who are illustrators and not writers?" There's, again, everything's intersectional, there's all these ways of connecting and participating in this conversation. Laurel: If I as a middle class Jewish white lady living in the Southeast only want to hang out with other middle class Jewish white ladies living in the Southeast. If that's my community, then I've made a choice not to expand my world. Jackie: Yeah, I wonder though, if you do have to take into consideration that some authors are just introverts, some authors don't interact with tons and tons and tons of authors. Some authors aren't spending lots and lots of time on social media, and when they do they feel awkward and out of place. Jackie: What if those people also they really believe in this and they really want to put themselves out there to make this difference but they don't necessarily know. Laurel: But I think what I'm saying is we're already self selecting, we're talking about a bunch of people who signed an online pledge that they found through Facebook and are listening to a podcast. We're thinking about the listeners, they may be introverts but they're introverts who are engaged actively in this social media online community, they are. My husband is an introvert, we use our phones differently, but we're both constantly consuming in our information. My point is you can be an introvert and not want to tweet but if you're on Twitter, you're following a bunch of people, have you thought about the fact that the people you're following are people you're likely to know anyway. Do you know what I mean? I guess it is on some level a challenge socially to say to people like it's again everybody has a right to choose the world that they want to live in, that's the way the world is now. Jackie: Did your jaw drop to the floor? Laurel: This was years ago, this was a long time ago before the conversation was as obvious as it is right now. It felt different back then. I feel like we're all learning constantly and I just I was like there is no way, I don't care what part of rural Maine you're in, you don't live in a world where you can ... It's not possible, it's not possible to live in an all white world now without having chosen that. I think people believe that, they believe that they just happen to only listen to music by white people or they only happen to read books by white people or with white people in them. And they only happen to vote for white politicians, like they're not racist, this is just the stuff they like. They don't understand that that bias is buried in them from childhood by their parents, by the neighborhood they live in, by the schools that they went to. Our job is to change that bias. Our job is to open up ourselves. Laurel: Like I say, and make mistakes stumbling forward, and so to those people, I would say, "You can be an introvert, you don't have to talk, you can listen. But think about who you're listening to and if you ..." Again, I don't know the community, the writing community of Wichita, Kansas, but I know that Kansas City isn't that far away and I know that St. Louis isn't that far away. I think, my geography is not so good. But the point is I do, I feel like ... We're having this conversation today in part because we just suddenly in the last few weeks have seen a big run of large conferences and festivals that suddenly seem to be amazingly white. Laurel: In places where that was the argument of like, "Well, we're dependent on goodwill and donations. Like, we don't have any money, we can't bring anybody in from someplace where they'd have to fly from." Jackie: I call it the we tried syndrome because you hear that a lot from conferences, "Well, we tried, we really tried." Laurel: The question is like, "Well how hard?" That are you still there? Laurel: Okay, my phone suddenly went dark and I couldn't, and I'm assuming we can edit out me asking that in production if need be. What was I saying? I'm sorry. Jackie: About the we tried, people who try, who've tried, and how hard they've tried. Laurel: Right, and I think we all have our own little lens. When my husband and I have to decide where to take the kids to dinner, we think of the same 10 restaurants every time but there's hundreds of restaurants within two miles of my house, I just always go to the same 10 restaurants. If I want to make a choice to break out of that mold and try something new I have to consciously resist my default, I have to go beyond my default. I think this is we all do it. I don't mean to fault any one organizer or any one author or any one publisher that we all default. If you're in, because there hasn't been, this has not happened in Iowa City and it's a city that I know well and the door but it's also super white. I'll make an imaginary example. Laurel: Iowa City decides to have a children's book festival and they invite 12 people and they all happen to be nice white people and I'm one of the authors that's invited to that. The question is like okay well what do I do when I realize this? I love Iowa City, my in laws are there, I would like to go and visit them. It's a free trip to Iowa, whatever. The answer is, "Well, right." Then I as an author can stop and say, "Okay, well, what's near Iowa City?" Let's assume it's not true but let's assume that there are no people of color writing for children in Iowa City or immediately around it, how far is Chicago? How far is St. Louis? How far is Des Moines? What is the SCBWI chapter look like there? It takes me like 20 minutes to cast my net and see who might be a good option to join me or take my place at that festival. Laurel: I'd be very shocked if ... I think my experience has been that if you have the solution, rather than just saying I can't come because I signed this pledge, if you step forward and you say, "I'd love to come but also I happen to have noticed that this panel is all white. I wonder have you thought about person X, Y or Z who might also enjoy coming in from Chicago? They're great and I really think that your festival could benefit from diversity etc., whatever the languages." I'd be very shocked if that organizer doesn't respond with, "Oh, of course, we'd love to have you both." Jackie: Right, now there's so much good stuff that you're saying and my mind is going in a few different directions. I want to ask about two separate things. I am going to talk about a specific festival without naming any names because again there's no need to name names. But I'm looking right ... Well, all right, I'm looking right now at a photograph of a recent festival and I'm just going to count right now. One, two, three, four, five, six, seven, eight, nine, 10, 11. It appears from this photograph that there were 11 presenters. Jackie: It appears from the photograph that three out of those 11 are people of color. Laurel: That was intentionally vague. Jackie: That was intentionally vague, right? Let's just start with the question, three out of 11, does that feel meaningful to you or would you as if you are going to this festival, would you say, "That's problematic, I think something should be brought up?" Laurel: I have been at least a fly on the wall in the room where the Decatur Book Festival was created and have had one relationship or another to the festival tangentially. I've never worked for the festival but since its inception and I've watched it grow and change and find its feet, and then make some really conscious decisions about these kinds of things. For the last couple years, I've been on the programming committee for the children's festival within Decatur Book Festival. Decatur Book Festival, for people who don't know, is the largest independent Book Festival in the country at this point. I think we have like 70,000 people this year or something. It's a big festival. Laurel: But it's a big festival with no money and it's a big festival that runs on goodwill and elbow grease. It has been an evolving thing that we realized a bunch of years ago that it's insane that a city like Atlanta which has an amazing wealth of African American culture, and also all sorts of other cultural identities represented in our writing community here and in our children's like community. That at some point a couple of years ago looked around and thought, "Oh, we need to do something." Like I said, everything's changing. So five years ago, maybe I don't remember what year exactly, but five years ago it still made sense. We were like, "Oh, we need to do better, let's have a diversity panel." Now we would look back at that and be like, "Oh, that's terrible." But five years ago looking at our all white panel, basically, because we were accepting the invitation. Laurel: We were accepting the pitches from the publishers and the publishers were sending us these authors and we were saying, "Yes, please, thank you." Because we felt grateful that publishers wanted to send fancy famous people to Decatur, Georgia where we were sure to get a huge crowd. Like we were grateful, so we took them. Five years ago a diversity panel felt like a reasonable thing to do. Each year there's been some sense of like we need to do better, we need to do better. This year because I had done the pledge immediately beforehand it was like this needs to hit the 50% mark. We need representation on all panels but also it would be really amazing if we could actually look on all levels. In a much more intersectional way, if we could have queer representation and Muslim voices and just anyone ever. I feel like I'm going to start a list then I'm going to leave somebody out. Laurel: But that takes time and so I think what I would say, and an answer to your question, is I would feel out the conference and I would say, "You know what, it may be that three of 11 for that conference this year is a really big deal and is meaningful representation." It may be that they worked really hard to get to that number and they have no ... There are different circumstances, that number would not be acceptable to me at Decatur given the population in Atlanta and the wealth of talent of all kinds here. At this point, the ability we have to ask for speakers from publishers, I don't think that that number would be okay with me. Laurel: I think that's why I left that big. Laurel: That's because while we came up with a very specific, there's two things, right? The first one is don't be on all white panels, that's pretty cut and dry and we made that super specific. Then the other one was, and beyond that, use your judgment and I wanted there to be a use your judgment element. Jackie: Right, because as a person just looking at the photograph, and it's one of those group photographs that conferences take, it's what strikes me most is the whiteness of it. It just comes across that way and then when you start to count the numbers and you say, "Well, okay, what percentage is that? Is that an adequate percentage?" I learned later that somebody was missing from the photograph who was also there and who was a person of color and so it becomes complicated in terms of trying to figure out is this where I put myself and say, "I need to do something, I need to address this as a person who's going to be participating in it." Laurel: I think this is where it gets harder. In some ways, that's why the baby step is the specifics. The baby step is it's very easy to say like I took this pledge, I can't be on this panel because everybody's white or everybody seems to be white or everybody identifies as white or whatever. The harder thing is that I think as we think more deeply about these things, we realize it's never going to be enough. It's never going to be enough. I want a transgender, Latinx person with disabilities in the audience to see themselves represented on the stage. I don't feel like there's a way to make a set of rules that are ever going to be good enough to give us what we want in terms of representation. We want to go into schools and we want our books to speak to ... we want every book to speak to every child, it's not possible. We want every conference or every panel to speak to every person sitting in that audience so that nobody feels left out, it's not possible. Laurel: The world's never going to be that kind, it's never going to be that fair but the point is to be always moving things in the right direction. I think I left that vagueness there so that if each person has taken the pledge reaches for the very best they can do and defines that vague space accordingly, we'll just keep doing better. Does that makes sense? Jackie: Yeah, each step, every step moves forward. Laurel: For me, meaningful representation is far more than it was five years ago and I'm going to assume that that's probably true for a lot of other people too. That what looked okay because you had someone of color at your conference five years ago doesn't look okay anymore because we're actually getting better. I want to believe that, I want to believe that. Jackie: Right, but in the end, meaningful representation is an individual judgment call and it's a moving target and it's circumstantial, and there are a lot of elements to it. I'm glad you brought up the question of audience. I am going to read a comment and I don't think the person who wrote this comet is going to mind for one minute that I'll attach her name to it, it's Laurie Halse Anderson. Laurel: Yeah, she can hardly take it. Jackie: Who said, "Yeah, happy to add my voice to the scores in addition to speaking on panels that reflect America, ask conference organizers what steps they're taking to make attendees of all kinds feel welcome and respected? If you present in front of a sea of white faces, talk to the organizers about it. They need some encouragement to do the right thing." I think we've all been in that situation where we look out and the audience is just overwhelmingly white. This is extending the pledge because obviously this was not part of the pledge but what are your thoughts about that? Laurel: Oh, I mean, I think that we ... How do I say this? I think that we want to think that things will just naturally get better and that there's a trickle up. A, I'm not sure the world's getting better right now and, B, that just doesn't work. We know that the best way to, in the book world, create more representation among readers and among characters and among is to correct that within the industry. That we need more marginalized people of all kinds in editorial roles, in publicity roles, in business role. We need, that it will filter down. Part of that problem is, honestly, that this is ... Look how this gets so complicated but most of these festivals are organized by well intentioned white people. They're reaching out for volunteers among their community which tends to be because of defaults, largely white. Laurel: Then those people are promoting it in like say newspapers or websites in their community where they go for their information, which are going to be predominantly white and so forth. I feel like all of these things are linked and they all come back to leadership. I'd say like one thing that needs to happen is we need to see more diversity of all kinds at the top levels of everything. I feel like that is something people should be thinking about as they hire, as they build boards, as they bring people onto steering committees, things like that. That having diversity on all levels of all kinds of marginalized peoples involved at every step of decision making will ultimately alter more than anything else can what that sea of faces looks like. I will say this year I felt, I don't know if anybody would agree with me, I felt looking out at the signing lines at our festival, I felt like I saw more meaningful diversity than I ever have before. Laurel: Not unrelated to the fact that we brought in more authors of color, not unrelated to the fact that we have people on our committee who are people of color. That these things are all related to one another. Jackie: One thing leads to another, one thing feeds the other, one thing encourages and helps the other. Laurel: I can't identify cause and effect but I can say that I feel like there's a general swelling that happens. Jackie: Now, I promised at the beginning that we were going to stay focused and now I'm going to break that promise. Just because I had an interesting conversation yesterday and so I'd love to just bring up this one thing. In terms of the pledge which is specific and addresses one very specific thing, I was talking to somebody about one approach is to give way as a white person on a panel in which everybody is white to say, "Well, you know what, I'll step back and that will leave space, that will leave a space for you to invite a person of color and that will add to the diversity. I said that's something that I would feel very comfortable doing saying, "You know what, you're covered in terms of white middle aged woman on this panel. I'll step away even if it's a panel that I would very much like to be on, I'll step away so that there's room." Jackie: Sheep, the person I was speaking with said, "Well, wait a minute, then if you're willing to do that, we need to push that, would you turn down a book contract?" Would you say, "No, the world doesn't need another book from a white middle aged woman, there plenty of those out there." Would you seed your space there to allow a book, hopefully, perhaps by a person of color to find its place. Because there are a limited number of books that get published every year. What's your take on that? Jackie: I felt like I understood the correlation but I too said I don't think it's the same thing, but I'd love to hear what you think? Laurel: Again, everybody has to make their peace with these things, everybody has to find their comfortable place or their uncomfortable place with these things. Ideally a little bit uncomfortable. Jackie: Sacrifice. What are you willing to give up? Jackie: She was saying you should be willing to give up. Obviously, this was an intellectual argument that we were having, where does this go and how far do you go? You should be willing to give up your place as an author because you are taking the place of somebody else of a more diverse voice that might be needed and heard. Laurel: This brings us very neatly back to the beginning and the idea of privilege and comfort. We're basically back talking about that of like I am accustomed to being able to have like I am accustomed to believing ... and I'm going to avoid talking about national politics, I'm going to restrain myself, but many people are accustomed to the entitlement of what they think of as meritocracy. That if you're good enough at something and you work really hard and you don't slack off, you should get the fruits of your labor. If you happen to have gone to a really fancy expensive prep school and an Ivy League college and so forth, that is obviously the result of your hard work. You're smart, it affirms that you're smart and therefore you deserve to have a fancy job where you make a lot of money and therefore a nice house and then for your children to go to a fancy prep school etc. Laurel: I think that this is built into upper middle class America and everywhere else too but it's definitely, definitely built into the world of people who go to nice colleges and fancy prep schools and live in neighborhoods with well manicured lawns. There's definitely that idea. I grew up in it for sure and I didn't have a lot of money but well educated people want to believe that a good education is the product of hard work and you deserve it, etc. I think books are the same kind of thin, you feel like I've worked really hard and I've put in all this time and if I'm at this place now where somebody wants to publish my book, it must be because I deserve it. I would argue that that's not always true and that a lot of this stuff does happen through mutual connections and knowing how to speak the right language and say the right buzzwords and somebody introduced you to somebody who introduced you to somebody. And somehow years later that turns into a book deal. Laurel: This stuff can be really vague and windy but I think there's a key difference. I would argue like, theoretically, I agree with what your friend is saying. I think there's a difference here, which is that I don't think there are a finite number of books. I came into publishing for children from poetry and in poetry there are actually are a finite number of books by ... unless you want to self publish, because it's all these contests. Yale younger poets does five books a year and if all of those books are white, then there's nobody, there's only so many good publishers doing a good job of publishing books of poetry. It felt very finite. Children's literature seems to me to have the opposite problem, which is that every year there are more books published than the year previous. Jackie: Did you have an interview with Laurel Snyder when she said you shouldn't be smacking a dog around? You just put our ratings through the ceiling. Jackie: But all voices are different, that's a whole different discussion. Laurel: But I do think the question is if you see the need say for a book about like a traumatic thing that happened in another country and you go, "Oh, oh, somebody's going to want to do a book about that. I'm going to jump on that." You pull a proposal together and because you're well connected and you've done a bunch of books already, your editor says, "Yeah, that thing is going to sell. The thing is this is where it gets ugly and capitalistic is like the book is going to sell because every school is going to need a copy of the book about the traumatic thing that happened. The first person to dash that finish line and do a book about say a pink hat or some kids in a mine, like that person is going to sell the books. I would argue that the pink hat book should be by somebody who has a pink hat and the kids in the mine should be by somebody who has some personal relationship or affinity to that story in one way or another. Laurel: I would say while I don't think that I don't have a right as a ... I don't think that it's fair to say like you don't have a right to tell your story. Every, first of all, everybody should write all of the things they want to write, how and when they choose to publish them when offered the opportunity is a different conversation. But I believe firmly that writing is good for us and we should write the stories that we feel the need to tell. Whether you choose to publish them or how you choose to publish them in terms of sensitivity to other people's marginalization, that's a different conversation. So should you say, "I'm not going to publish my book about a pretty leaf that fell out of the sky that I feel deeply the need to tell because somebody else might have something else they want to say," I think that's a little bit far afield. Laurel: But I think if you're trying to tell a story because it seems like a good way to get published or because you think it might have bigger sales than your last book or just because it's interesting to you but you recognize that you're not the person who probably can do the best job with it, I would just say that, again, vagueness. I'm not saying you can't, I'm saying I would stop and ask that question. Jackie: Stop and think about it. Jackie: Let me ask you one more thing before we wrap up and that is that in the age of social media and the internet, we live in a time of Call-Out, the Call-Out. The public Call-Out for somebody who's done something that we find offensive or reprehensible or morally suspect or whatever. In terms of conferences that do put forward faculty that seems too heavily skewed toward the all white direction, whether it's all right, all white, or almost all white. There's been a lot of discussion on social media calling these conferences out publicly saying, "This is wrong, you shouldn't be doing that." How do you feel about the public Call-Out? What do you think it serves? Do you think it's one way to go in terms of trying to advance, fumble and advance, the good intentions that most people have? Laurel: Yeah, I do have strong feelings about this and I know that a lot of people disagree with me. I think, again, there's vagueness here. I think we all should stop and think and choose our moments and choose our words and make sure that what we're doing is effective and powerful and not just screaming into the void. Sometimes I know I have felt this myself the last few weeks, politically, the desire to just blast everything and scream about everything because I have a lot of screaming to do. That's about what I want to say, what's inside me what I need to do and in theory I should go write a novel or a poem rather than screaming into the void because it's not actually going to heal me. There's I would say two different things, one is when you want to scream. When something makes you mad and you want to shout at somebody or shame somebody or drag somebody. Laurel: Not I think is ineffective politics and I would encourage people to check themselves in those moments. The other is that people who have historically not had a lot of power, and on some level that's everybody, like very small portion of people have had a lot of power for a really long time. And suddenly we're in this very democratized place where those of us who feel like we would never have had a chance to have power can. We can bring down a candidate, we can shut down a restaurant that we think is gross. We can, you can, you could, I could if I wanted to right now target the ice cream restaurant. There's an ice cream place on my corner, I can target the ice cream place and I could probably because I have enough social media followers and friends in the community. If I really wanted to start telling horrible stories about this ice cream store, I could totally shut that place down. Laurel: I could lie, I could plant stories, etc. I'm not going to do that, I don't think for the most part people are going to do that because people don't in general want to waste their energy freaking out about things that aren't real. I think there's this idea that the Call-Out Culture and I feel like that's become such a pejorative term that the Call-Out Culture is just a bunch of crazy people who just want to drag other people down. I don't think that's true, I think most of the time these things happen because people who feel voiceless and marginalized see this as their only recourse to make change in an industry that hasn't made space for them. Whether that's women or that's people of color or it's disabled people or people of religions that have been marginalized, whatever, it can be an ugly moment and it can be really ... On some level, I spent a lot of time wondering like, "I'll record this podcast and maybe I'll say the wrong thing." Laurel: Like everybody gets to be the expert in their own pain, and if somebody feels like a victim, if somebody feels hurt by something, they are in charge of that feeling. The fact that somebody else didn't intend it a certain way or that that other person thinks that the Call-Out Culture is exaggerating doesn't change the fact that those people have pain. I don't know and to bring it all back, to just kind. Like that to me, the idea I feel like we end up in this place of Call-Out Culture isn't choosing kind. It's like, "No, Call-Out Culture is explaining their pain to the person that caused their pain and that person isn't listening." I would argue that that's not choosing kind. Jackie: I think as I'm listening to what you're saying and always I'm trying to bring us back to this specific topic that we're thinking about. I have to tell you, I keep looking at this photograph of this recent festival that was beyond white. So it keeps popping up at me and I think about, sometimes what happens, I think what we see happening with the Call-Out Culture, if we want to call it that, somebody will post something that is simply a respectful way of saying, "I'm seeing this, I'm noticing this, I'm looking at this photo right now and it sure looks like it's an all white grouping of authors. It troubles me and I'm thinking about it and I wonder, if the people who organized it might want to respond or might have something to say. Of course, we know that people putting together literacy conferences are, I would say, almost to a person, good people trying to good work. Jackie: Trying to bring the subject of literacy, trying to help children with getting books and having books and having access to authors. These are good people doing good work. Somebody in the community is saying, "I have a problem with this and that would be let's call that the public Call-Out. But then what happens is because it's social media, because it's the internet, it just can sometimes spin just out of control. Suddenly, people are piling on in all kinds of ways, and so then what started out as a respectful call to notice something and to express something about a person's experience of something, suddenly turns into this swirling rabid mess of all kinds of intentions coming out. Laurel: Well, I think the pendulum is swinging, is always swinging and right now we're off to learning. We don't have an etiquette, we don't have a ... Not an etiquette, but we don't have a code for how these things work yet because it's all still so new. I think we sometimes forget that, that technology moves faster than that code of ethics that attends to it. I think we're still figuring out how best to use these things, how to be most effective. Some people just want to yell, we've all seen trolls go to town online, right? Laurel: Some people just want to yelp, most people don't, most people see injustice, want it corrected or they have some kind of pain that connects them to the moment in the story and they are finding the place to put that pain. I think part of what we're seeing is that a lot of what we're looking at is Call-Out Culture or these frenzies are people who've been restraining that for a long, long, long, long time. People, it was funny after NRC's Survey, people were parsing out all the different cases. This guy's a real problem but this guy's not a problem, that's my friend. Like that kind of thing, but if you step back and look from the distance what you see is a whole lot of people have a whole lot of pain and they've been holding onto a whole lot of stories for a long time. Laurel: This case may be worse than that case or this case may seem more problematic for one reason or another, but what we're seeing is that a whole lot of women have a whole lot of pain and we're going to try and do something about that. I just feel like, again, it's about, this is all about change, the pledge was about change, these moments of call-out stuff online are about change. They are about people saying things are not as they should be, I don't know any other way. So what I would argue is if like ... I've had several instances with that just in the last few weeks of people coming to me, and what they're really looking for when they ... not the people who want to make change, but the people who are coming to me, I had one person from a very large organization reached out to ... It was the organization's life connects to a lot of these kinds of things and asked me to basically if they could help me rewrite the pledge. Laurel: Now that it had 287 signatures or whatever, if we could rewrite the pledge to make it easier for people to be more compliant. What that is to me is that is somebody saying, "I want the illusion of justice and integrity and momentum and progress, and I don't want anybody to have to actually make a sacrifice." In that moment when the Call-Out Culture start, stuff starts, whatever, I hate, it makes me uncomfortable to use the term. But in that moment where that stuff starts, if the person who's being targeted actually stops and says ... This does happen sometimes, you see the difference when they do it, stops and says, "I need to take a minute here." To the initial person, to the person that initially posted them, to the thoughtful person, what you're calling the thoughtful person. If their response to that is, "You're telling me something I haven't thought about yet, I need a minute to think. I really appreciate your input. I'll be back in a minute." Laurel: Something along those lines of like, "I'm going to try to learn and grow here, I need to think." Because I do think that there's an aspect of speed to all of this. We shouldn't have to do everything in 10 seconds before the next tweet comes, there is I think a problem to the speed of things. But I feel like when those cases happen where somebody actually responds and says, "Like I know that, I think we all do." Everybody has a book they wrote 10 years ago that they wish they could go back and do differently, and we're all sitting around waiting for that moment where somebody comes to us and says, "I read your book and it's really upsetting to me." I don't know about other people, but I'm sitting here with a list in my head of the things that somebody might reach out and say to me. How I want to be prepared in that moment to say, "Thank you so much, I'm sorry for your pain. I'm trying to do better." Jackie: I think it's so easy, I think it is our natural response in many ways to respond defensively whenever anything is put at us that makes us look like we have made a mistake, we've been less than what we've hoped to be. So defensiveness is such a natural response but this brings us back to what we started with at the very beginning, which is the beauty of the fumble. That fumbling is okay. Making mistakes is okay. Laurel: It is the only way forward. Laurel: We are revisers, like that's what we do. I benefited from being in a creative writing workshop in high school and I think about that a lot. That when I was 15 years old, I was trying to learn how when people said to me, "I don't like this about your poem." To say to them, "Thank you, I will think about that." At the end of the day, it is the creative process, it is whether it's your own internal critic or somebody else or your teacher or your reviewer or whatever. We have editors, we have reviewers, we have friends who read for us before we publish, we have children who tell us what they think. If we can't accept criticism incorporated into our process and do better next time, I don't know who can. Jackie: This conversation I feel like could go on all day. Jackie: We have to wrap it up at this point, but when getting back to the pledge, which is that this [crosstalk 01:07:37] of this conversation which went in so many interesting ways. Thank you so much for all you had to share. I think we can both agree, we probably fumbled a few times during it and that's great. That's what we're going for, and that you have to be willing to make mistakes to move forward. I think that that's something that can be applied to much more than the pledge. But the pledge I think is going to continue to be an interesting topic of conversation but also an interesting way that pushes people to keep moving forward. I think for no other reason, it's incredibly valuable for that. Thank you, thank you for putting it out there for all of us to think about, consider, and for it to push us in ways that requires sacrifice and that make us uncomfortable. Laurel: Well, thank you so much, I really appreciate it and it's just nice to talk to you. Jackie: Yeah, it's been great. Laurel: I really appreciate this chance. Jackie: Thanks so much. Thanks so much, okay, take care. Bye-bye.